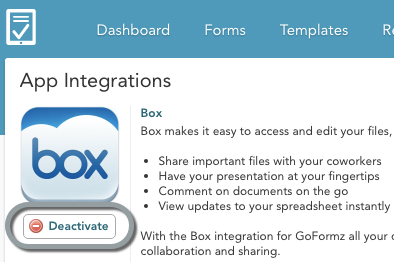 The GoFormz-Box integration lets you automatically upload completed forms and reports to Box. 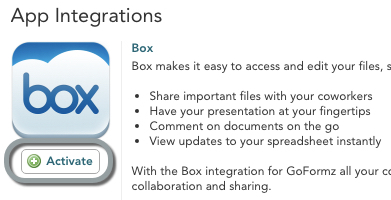 If your organization uses Box as its enterprise storage solution, this is a very valuable feature. 1. Expand the More dropdown in the header and select Box Integration. 2. Click the Box logo to open the activation screen. 3. Click the Activate button. You will be prompted to enter your Box login credentials. 4. Enter your Box credentials and click Authorize. Don’t worry, it’s completely secure. 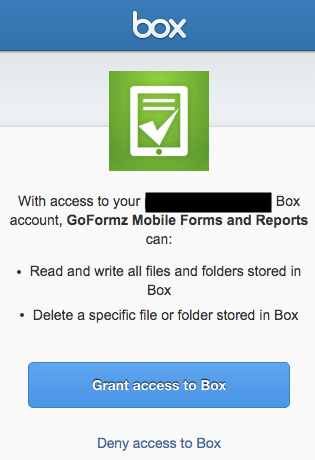 The next and final screen lets you grant GoFormz access to your Box account. 5. 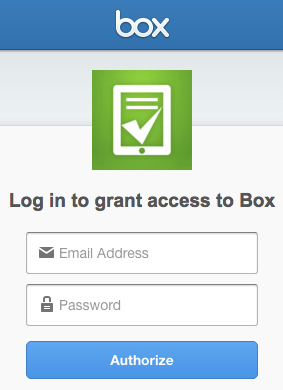 Click Grant access to Box to complete the integration. This will allow GoFormz to read and write files to your Box account. GoFormz will not manage any of your Box settings. And that’s it! Your Box account is now connected to GoFormz. You can disable the GoFormz-Box connection at any time. To do so, navigate to the Apps section in the Account Tab, select the Box app, and click the Deactivate button.